but before you do leave a comment and I'll enter you into a drawing for some Imaginisce goodies! Leave me another comment that you are a new follower or already follow and I'll enter you into the drawing twice! I think your card is fabulous. I love the old fashioned post card look and those stamps are just so adorable. This is beautiful, love the stitching! 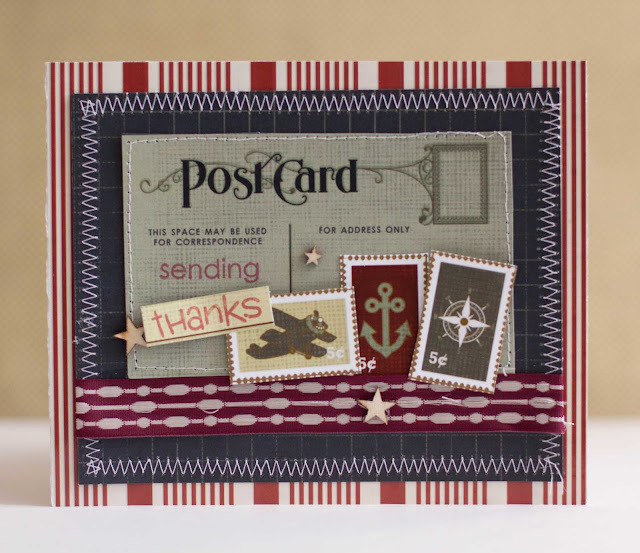 Love the vintage feel to your card! I'm a follower. I love the stamps and the stitching. Great job! Wonderful card! Love the stitching and the stamp images! Love those "postage stamp" embellies and that wonderful stitching! I love your card, Rebecca...such lovely colors...patriotic, yet appropriately somber. I like how the "stamps" represent each of the armed services and the beautiful colors combined to look so patriotic. Such a beautiful card....this is one of my favorite Imaginisce collections. I am already one of your blog followers. Love the colors and embellishments, patriotic. great stitching detail, and layering. thanks for sharing. Very nice card, lovely use of embellishmente. I like the postcard, stitching and the embellishments. Love this card ! The stitching is really cool ! I'm a new follower. What a wonderful card. Love the postcard look. I am already a follower of your blog. Thanks for sharing. Such an amazing card and all the little postage stamps. Looks just like a postcard. Great details. Thanks for sharing. Love your card and all the details! What a clever card, love the stamps on it and the stitching too. This is such a great card! Loving the colors and how the Christmas PP blends in perfectly! The stitching adds the perfect touch! I keep meaning to try that technique but dread pulling out my sewing machine & then packing it up again. It's old & heavy! I'm already a follower & have been sneaking peaks at your blog for almost a year now!